WardJet has released its X-Series line of waterjet-cutting machines, newly designed to increase speed, accuracy and machine durability. Its components, including the re-engineered crossbeam, are simultaneously lightweight and sturdy, and are instrumental to the improved performance of this series, according to company officials. The crossbeam holds multiple cutting heads, and a variety of aftermarket components can be added to increase machine capabilities. 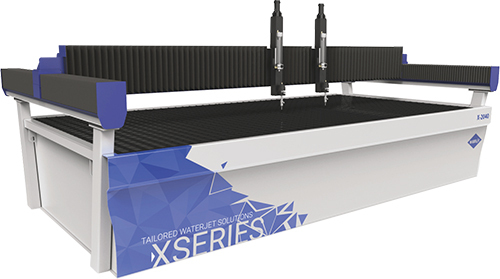 The X-Series line consists of three models: the X-1515, X-1530 and X-2040, with cutting envelopes of 5 by 5 ft., 5 by 10 ft. and 6.7 by 13.1 ft., respectively. Line options include an internal variable-water-level control that doesn’t reduce the cutting envelope. This option allows operators to cut material underwater, which reduces splashback and noise level while cutting. The series’ open design enables material to be loaded from the front, back or sides of the machine. All X-Series waterjets ship with newly released Move motion-control software. Developed inhouse, this intuitive waterjet-control program offers a user-friendly experience, according to company officials, and is designed to run on a new, 24-in. multi-touch and water-resistant all-in-one display.